Swansea City head coach Francesco Guidolin was disappointed at being denied victory at West Brom but remains optimistic. Gylfi Sigurdsson's second-half strike from 12 yards looked to have secured victory for Swansea. But Salomon Rondon's injury-time goal rescued a point for West Brom to deny a third straight Premier League win for Swansea. "I'm disappointed but positive because the team played well," Gudolin said. "At the beginning 1-1 could be a good result, but at the end I'm disappointed. "My team played very well for all the match. West Brom are a good, strong team and are difficult to beat here." Swansea dropped to 16th, five points clear of the relegation zone after Rondon's late equaliser at the Hawthorns. Swansea later tweeted the South Korean was "OK, just a little concussed", but is a doubt for Saturday's game against Crystal Palace. Replacement Paloschi could have doubled Swansea's lead before Rondon's injury-time leveller. Guidolin was full of praise for fellow Italian Paloschi, who joined the Swans from Chievo for £8m during the January transfer window. "He's just arrived, but he has a lot of passion and enthusiasm," Guidolin added. "This is a dream for him, and I am sure he will be a good player for us." West Brom are eight points above the relegation zone in 13th place, three points ahead of Swansea. 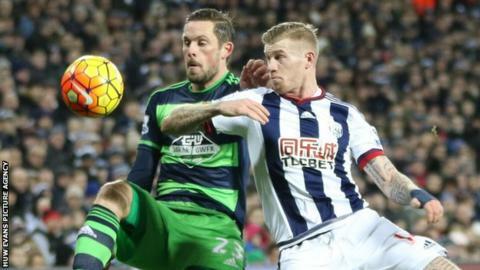 Baggies' Welsh manager Tony Pulis believes the Swans are too good to go down. "They've got too much quality to not stay up," Pulis said. "When they're in possession and you give them time they pass the ball ever so well and they could have scored two or three goals on the break."